This was such an easy pasta dinner to throw together. Substituting cooked rotisserie chicken makes getting this meal on the table even quicker. About once a week my husband brings home a cooked chicken. I like to use the leftover chicken for this meal, Chicken Enchiladas, or Cream of Chicken Soup. I added extra mushrooms to my pans so that I could cut done on the cooking time for the mushroom, sausage, and parsley quiche I was planning to make over the weekend. This is a trick that I use a lot. Whenever I am making vegetables for dinner I try to plan to have enough left over for breakfast. Zucchini, carrots, brussels sprouts, and even broccoli are great vegetables to put in scrambles and quiches. Cook the pasta according to the package directions. Drain the pasta and reserve 1 cup of the cooking water. Place teh pasta and water back in the pan and stir in the Parmesan cheese and stir until it has melted. Keep pasta warm over low heat. In a separate pan, heat a tablespoon of olive oil and add the chicken, sprinkle with salt and pepper and saute until cooked through. Add the chicken to the pasta. In the same pan, add the chopped mushrooms, sprinkle with salt and saute for for about 7 minutes. Add the spinach and heat until just wilted. 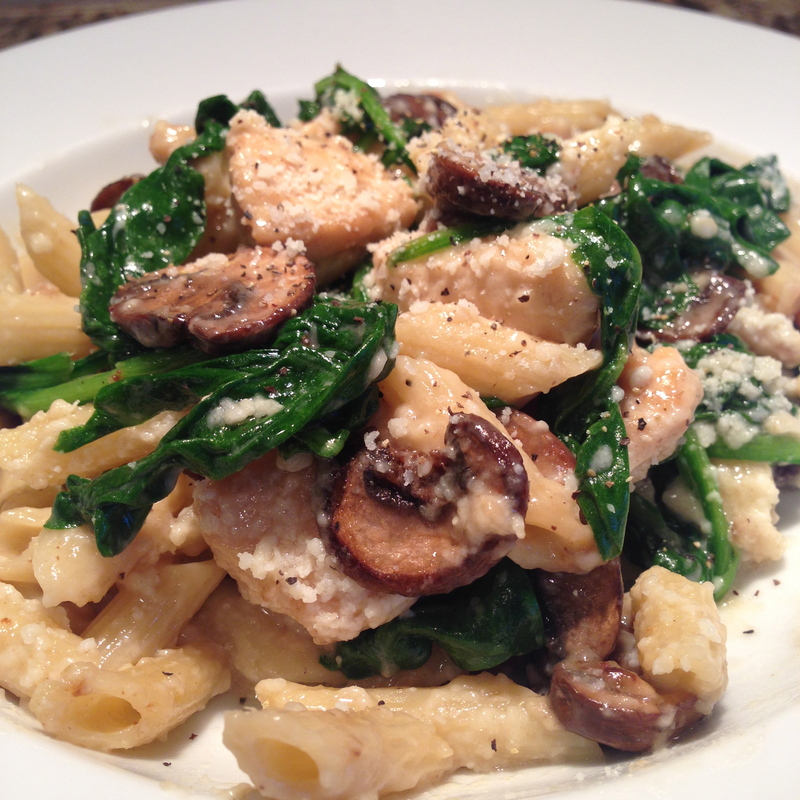 Stir the mushrooms and spinach into the pasta and serve.